You know what’s always in style? A set of gorgeous glow-getting products to pamper you after a stressful weeknight or on a Sunday morning. I’m all about the DIY spa day. This also makes for a fantastic gift idea for any lady in your life – your mom, your sister, your BFF, your boss – put a carefully curated selection of pampering goodies into a pretty basket or gift box and you’re good to go! These are a major key, especially if you have had a long night and suffer from lack of sleep. Stick them in the fridge for an extra refreshing and de-puffing kick. They instantly improve the appearance of tired under-eye areas and they tighten the skin, making you look more vibrant. Sticking them in the fridge and then applying them cold on your under-eye area helps restrict blood flow and in turn reduce puffiness. I am always testing out different eye masks but the most memorable is the SK-II Signs Eye Mask. I feel like a million bucks after I use it. The price tag, however, is not so fun which is why I only save them for special occasions. I am eyeing these eye masks by Shangpree next. Earlier this year I partnered with L'Oreal Paris Canada to promote their Pure Clay masks and they are so awesome! I'm still loving them and using them weekly. There are three of them and you can get all 3 and use them on different zones of your face for a customized "multimask" treatment or you can pick the single one you think you will use the most. My personal favorite is the Refining Mask - it contains red algae and also provides some physical exfoliation due to the tiny granules in it. Leaves my skin feeling baby soft. If you want some gentle acid exfoliation alongside your weekly clay mask regimen, the Tula Exfoliating Treatment mask won't steer you wrong. It's a bit more potent than the L'Oreal Refining mask given that it also contains lactic acid. Lactic acid is a gentle alpha hydroxy acid that helps dissolve dead skin cells and dirt on the surface of your skin, albeit it does it in a more gentle manner than glycolic acid. The Tula Exfoliating Treatment mask also has exfoliating particles in it - but fear not they are not plastic microbeads. They are naturally derived biodegradable granules made up of soybean oil, volcanic sand and Vitamin E. This also leaves my skin feeling incredibly soft and it minimizes the appearance of pores and blemishes. After your eye area and the rest of your face are revived and renewed, it's time to top up the moisture and leave you glowing. I love sheet masks for hydrating purposes. They leave my skin feeling plump and soft, every time. I am always up for trying out new ones, so it's a beauty category I like to experiment with. 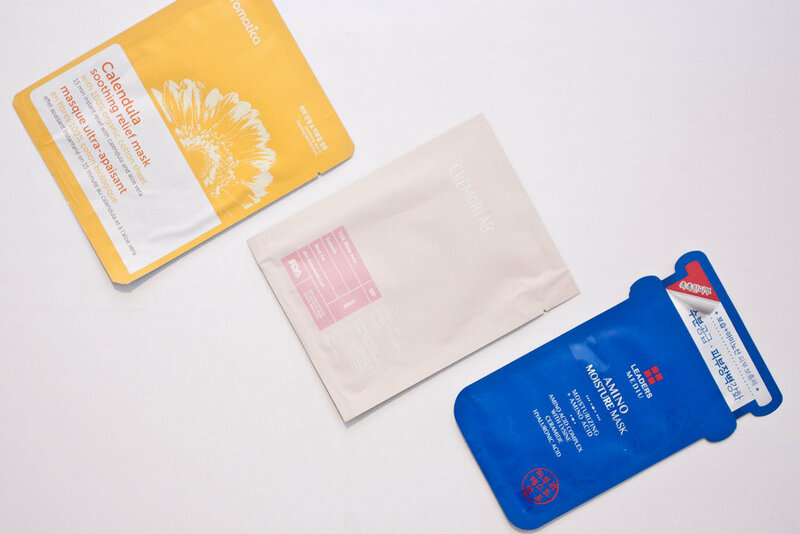 If you're feeling adventurous, like me, you can browse Peach and Lily and select from their vast range of sheet masks. I love that they sell bundles of different sheet masks that you can try based on your skin concerns. They also offer personalized skincare consultations on their site along with help on how to build the perfect skincare routine. The three masks I am currently using all boast hydrating and plumping qualities, and you can't go wrong with either. What's your at-home pamper ritual?